The Cohen Syndrome Association was founded in 2008 as a result of a family gathering in Middlefield, Ohio thanks to a call for parent leadership from the DDC Clinic for Special Needs Children. Parents that were committed in raising awareness with the goal of earlier diagnosis is why we are here to make this difference for others that are traveling down this same path. Since its inception the CSA has grown from a small group of parents to a global presence where we are empowering each-other with knowledge and support for our families. We are fundraising for our next Cohen Syndrome family conference so please visit the Family Gathering page to learn how you can help ! The CSA had a fantastic conference in June 2018 and we are already planning our 2020 conference. There are several active parent groups on Facebook where families connect with each other. This provides all new families much insight into daily living for our kids. Search for Parents of Children of Cohen Syndrome and Cohen Syndrome and the undiagnosed on Facebook to join in the conversation ! Please also join the Cohen Syndrome Association page on Facebook to keep updated on news and events. 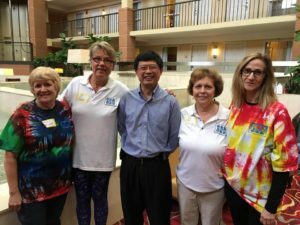 Shown below from left to right : Joann Holdorf , Treasurer / Lisa McElhinney, President/ Dr. Heng Wang, DDC Clinic/ Diane Wargo, Secretary/ and Beth DeMarco Board member.